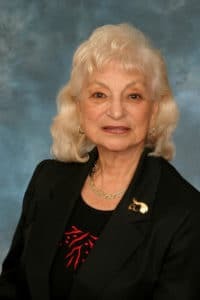 (Tuesday, March 25, 2019) – It is with a heavy heart that we say goodbye to former City Commissioner Roslyn Brezin who passed away in February. As a resident of Sunny Isles Beach for nearly 50 years, Roslyn was one of the City’s strongest advocates. Roz was my role model on a number of fronts. She aged gracefully and maintained a spirit and sense of humor that still rivals anyone I know. Roz always had a goal in mind and was relentless in pursuing her goal. However, she could vigorously advocate without being adversarial. These qualities endeared her to most everyone she came across. She will be deeply missed by all who had the pleasure of knowing her. Roslyn was appointed to the City’s first Charter Commission in February of 1997 where she worked with the other members to draft the City Charter and create our Council/ Manager form of government. Just six years later, she was appointed to the Sunny Isles Beach City Commission on October 27, 2003, to fill a vacant seat. Roz completed that term until 2005 and was re-elected, serving and advocating for residents until 2010. Roz championed several initiatives during her time as Commissioner including the school, City beautification, parks, and programs for seniors. She was always available and ready to speak with her fellow residents regarding issues related to improving life in Sunny Isles Beach. After leaving office, Roz continued to have an active voice and role acting as the ambassador for seniors in our community. Throughout the last couple of years, she became our chief supporter for the Gateway Park build out, which will provide a space for enhanced senior programs. Always at our City events and a regular at our bi-monthly bingo tournaments, Roslyn was a well-respected and longstanding member of our community. I know we will all miss her greatly. Her service and dedication toward making our City a better place to live will remain in our history books for all time.